They are ideal where a single tooth has been lost as they avoid the need for either a denture or the cutting involved in a bridge. If two teeth are missing, two implants are usually advisable. But, if three are missing, then two implants and a three unit bridge is quite often sufficient. Whereas a natural tooth is susceptible to decay if the bridge comes loose, a feature of an implant is that they cannot decay. 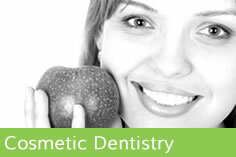 Not all natural teeth need replacement and a whole arch can be restored with just four implants. 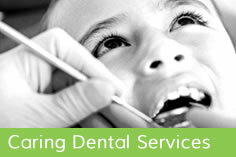 Individual circumstances affect the decision and all implant procedures need very carefully planning. 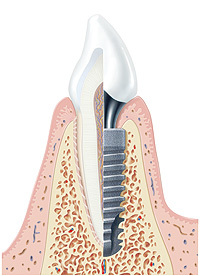 Dental implants offer the most natural replacement for missing teeth. Ideally an implant should be placed within 6-9 months after an extraction as bone ‘melts away’ or resorbs after roots have been extracted. An accident may cause the loss of a front tooth. 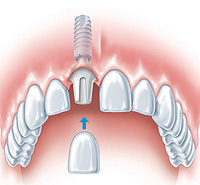 Rather than cutting adjacent sound teeth to provide a bridge (as was once common), a preferable replacement is a dental implant (or an adhesive Maryland bridge). Many people associate the loss of a tooth with getting older and request a replacement that is as close as possible to their original tooth rather than a gap or bridge or denture. Other people have been missing teeth for many years and have, as a result lost self-confidence particularly if a poor denture has been used as a replacement. 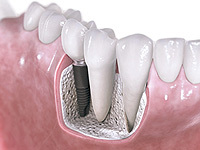 For these situations, dental implants have become a major break through to improve function, aesthetics and confidence. Well placed implants offer a totally new lease of life. The ability to eat, speak, and function normally is so much improved. People report that they feel less ‘old’ and that having the gap closed is a confidence booster. 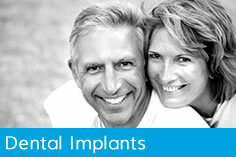 -see testimonials We use high quality implants.